In this day and age of technology overload, traditional archery is a mystery to many. However, one person who has made a life and career out of traditional archery is Scott Moore. When it comes to preparedness and also to the simple enjoyment of the outdoors, picking up a bow and learning traditional archery is hard to beat. In this episode, Scott does a great job of breaking down traditional archery to give all of us an educational experience that may be difficult to get elsewhere. How Scott Moore started in archery. What kind of archery equipment does Scott Moore use? Does Scott ever shoot compound bows? Is there a vast difference between compound bows and traditional bows, what about crossbows? 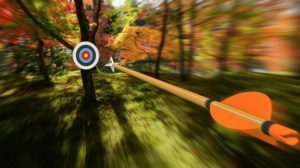 What is “instinctive” shooting, how do you aim a bow with no sights? How hard is it for the average person to learn to shoot a bow well? Where would someone get the proper training to become a successful archer? What type of equipment would you recommend for a beginning archer? What is one of the biggest misconceptions that the general public has about archery and or bowhunting? Learn about Scott’ scamp, what kinds of retreats he runs, and what kind of training does he offer? If you have any other thoughts or questions about traditional archery, please leave a comment below. Thanks for Listening to This Episode on Traditional Archery. Scott Moore is a teacher of traditional archery for bow hunting, survival, and preparedness. Obtaining his first bow at the age of 9, Scott cut his teeth as a bow hunter pursuing small game in the hedges and cornrows of central Ohio. Harvesting his first deer in 1975 with a 45lb. recurve bow, Scott now draws from an experience base of 43 successful hunting seasons and has harvested over 100 big game animals. Competing in tournament archery from 1976 till 1987, Scott has held many local and state titles and competed on a national level in 1987. Opening Scott’s Archery Shop in 1987, and operating the Savannah River Archery Shop and 3D range from 1990 to 1996, Scott has coached hundreds of people to become successful archers and bow hunters. Scott continues to share his passion for archery through his youtube channel (Wildaboutchrist), Archery Bootcamps, and speaking engagements throughout the country. Call 1-864-940-9626 and talk to Scott for more information. Loved this Pod cast got so much information in it, I think you need to do two just for him. Thanks, Glenn. I really enjoyed doing this podcast episode.